A cuboidal water tank is 6 m long, 5 m wide and 4.5 m deep. How many liters of water can it hold? The tank can hold 1, 35, 000 liters of water. A cuboidal vessel is 10 m long and 8 m wide. How high must it be made to hold 380 cubic meters of a liquid? Let 'h' be the height of the cuboidal vessel. Therefore, height of the vessel should be 4.75 m.
The areas of three adjacent faces of a cuboid are x, y and z. If the volume is V, Prove that V2 = xyz. Let a, b and d be the length, breadth, and height of the cuboid. If the areas of three adjacent face of a cuboid are 8 cm3, 18 cm3 and 25 cm3. Find the volume of the cuboid. WKT, if x, y, z denote the areas of three adjacent faces of a cuboid. The breadth of a room is twice its height, one half of its length and the volume of the room is 512 cu. dm. Find its dimensions. Consider l, b and h are the length, breadth and height of the room. And Height of the room (h) = 4 dm. A river 3m deep and 40 m wide is flowing at the rate of 2 km per hour. How much water will fall into the sea in a minute? Thus, 1 minute 4000m3 = 4000000 litres of water will fall in the sea. Water in a canal 30 dm wide and 12 dm deep, is flowing with a velocity of 100 km every hour. What much area will it irrigate in 30 minutes if 8 cm of standing water is desired? Cuboid length is equal to the distance traveled in 30 min with the speed of 100 km per hour. ⇒ 22, 50, 000 metres. Three metal cubes with edges 6cm, 8cm, 10cm respectively are melted together and formed into a single cube. Find the volume, surface area and diagonal of the new cube. Let ‘a’ be the length of each edge of the new cube. Two cubes, each of volume 512 cm3 are joined end to end. Find the surface area of the resulting cuboid. Therefore, Surface area is 640 cm2. Half cubic meter of gold-sheet is extended by hammering so as to cover an area of 1 hectare. Find the thickness of the gold-sheet. A metal cube of edge 12 cm is melted and formed into three smaller cubes. If the edges of the two smaller cubes are 6cm and 8cm, find the edge of the third smaller cube. The dimensions of a cinema hall are 100 m, 50 m, 18 m. How many persons can sit in the hall, if each person requires 150 m3 of air? Therefore, number of persons who can sit in the hall = 600 members. Given that 1 cubic cm of marble weighs 0.25 kg, the weight of marble block 28 cm in width and 5 cm thick is 112 kg. Find the length of the block. A box with lid is made of 2 cm thick wood. Its external length, breadth and height are 25 cm, 18 cm and 15 cm respectively. How much cubic cm of a fluid can be placed in it? Also, find the volume of the wood used in it. The external dimensions of a closed wooden box are 48 cm, 36 cm, 30 cm. The box is made of 1.5 cm thick wood. How many bricks of size 6 cm × 3 cm × 0.75 cm can be put in this box? Therefore, 2970 bricks can be kept inside the wooden box. How many cubic centimeters of iron are there in an open box whose external dimensions are 36 cm, 25 cm and 16.5 cm, the iron being 1.5 cm thick throughout? If 1 cubic cm of iron weighs 15 gms. Find the weight of the empty box in kg. A cube of 9 cm edge is immersed completely in a rectangular vessel containing water. If the dimensions of the base are 15 cm and 12 cm, find the rise in water level in the vessel. A rectangular container, whose base is a square of side 5cm, stands on a horizontal table, and holds water up to 1cm from the top. When a solid cube is placed in the water it is completely submerged, the water rises to the top and 2 cubic cm of water overflows. Calculate the volume of the cube and also the length of its edge. A field is 200 m long and 150 m broad. There is a plot, 50 m long and 40 m broad, near the field. The plot is dug 7m deep and the earth taken out is spread evenly on the field. By how many meters is the level of the field raised? Give the answer to the second place of decimal. A field is in the form of a rectangular length 18m and width 15m. A pit 7.5m long, 6m broad and 0.8m deep, is dug in a corner of the field and the earth taken out is spread over the remaining area of the field. Find out the extent to which the level of the field has been raised. A rectangular tank is 80 m long and 25 m broad. Water flows into it through a pipe whose cross-section is 25 cm2, at the rate of 16 km per hour. How much the level of the water rises in the tank in 45 minutes? Consider 'h' be the rise in water level. Water in a rectangular reservoir having base 80 m by 60 m is 6.5m deep. In what time can the water be pumped by a pipe of which the cross-section is a square of side 20 cm if the water runs through the pipe at the rate of 15km/hr. A village having a population of 4000 requires 150 liters of water per head per day. It has a tank measuring 20 m × 15 m × 6 m. For how many days will the water of this tank last? Thus, the water will last for 3 days in the tank. A child playing with building blocks, which are of the shape of the cubes, has built a structure as shown in Fig. 18.12. 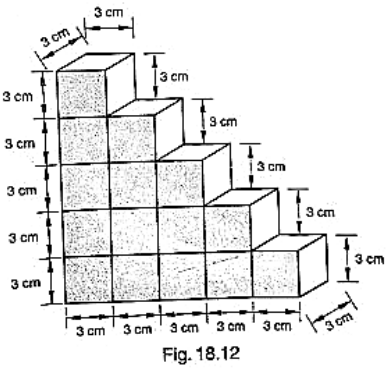 If the edge of each cube is 3cm, find the volume of the structure built by the child. A godown measures 40 m × 25 m × 10 m. Find the maximum number of wooden crates each measuring 1.5 m × 1.25 m × 0.5 m that can be stored in the godown. Therefore, the number of wooden crates that can be stored in the godown is 10666.66. A wall of length 10 m was to be built across an open ground. The height of the wall is 4m and thickness of the wall is 24 cm. If this wall is to be built up with bricks whose dimensions are 24 cm × 12 cm × 8 cm, how many bricks would be required? The wall with all its bricks makes up space occupies by it, we need to find the volume of the wall, which is nothing but cuboid. So, the wall requires 4167 bricks.